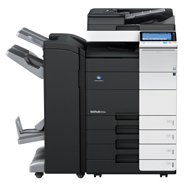 We offer a wide variety of black & white Konica Minolta copiers. Everything from your small office task to large business job. Not sure which model best suits your needs? 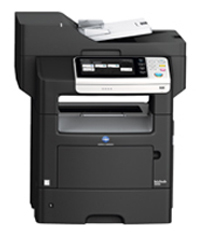 Click here to view the comparison of all black & white copiers. bizhub 25eThe bizhub 25e outperforms conventional “all-in-one” devices, bringing the productivity of MFP performance to your desktop: high-resolution B&W prints and copies at up to 25 ppm, fast color scanning from an 80-sheet reversing document feeder, even high-speed fax -- all in a small space-saving footprint. 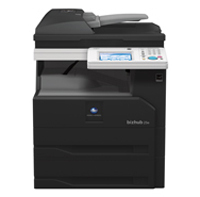 bizhub 3320With fast B&W print/copy output and color scanning, the bizhub 3320 all in one laser printer is a high-value addition to mixed networks of large and small MFPs as well as an all-around document solution with built-in Super G3 fax for low-cost productivity. 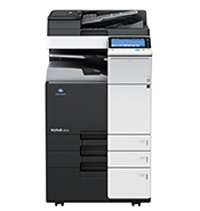 bizhub 4020The Konica Minolta bizhub 4020 packs higher productivity in smaller dimensions – up to 42 ppm print/copy output in high-resolution B&W, fast scanning to multiple destinations, simple touchscreen control and lower cost per page than conventional laser printers. Both models are ready for network integration, with built-in fax capability and support for PageScope and mobile printing functions – and their highquality,low-cost operation makes them ideal for branch offices, small businesses, nurses' stations, schools, law providers and retail locations. bizhub 4050 / 4750In any networked business or professional environment, the bizhub 4050 multifunction printer gets the job done better -- with fast 42 ppm print/copy output in high-resolution B&W, plus color scanning from a large 7” touchscreen that’s as easy to operate as a familiar tablet. BIZHUB 224eToday’s networked world demands a document solution with greater speed, power and productivity -- and the bizhub 224e gets the job done. 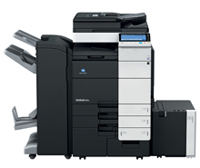 Konica Minolta laser multifunction printers feature fast B&W output, optional dual scanning of both color and B&W originals at up to 160 opm, modular options and a large color touchscreen to control both hardware functions and software solutions. 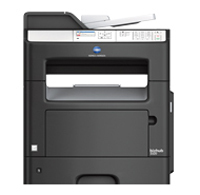 BIZHUB 284eTo keep you ahead of rising workloads, the bizhub 284e does far more than stand-alone printers -- printing and copying with greater speed in high-resolution B&W, capturing documents at up to 160 originals per minute, and raising your value with scalable productivity options for 4-line fax, auto finishing and enhanced security. BIZHUB 364eThe bizhub 364e puts you in total control, with a color touchscreen that’s as simple to operate as a tablet -- to print and copy at up to 36 ppm, scan both color and B&W documents at up to 160 originals per minute, and control the solutions your business depends on. You can add 4-line fax, security options, auto finishing and more -- everything you need for higher productivity. 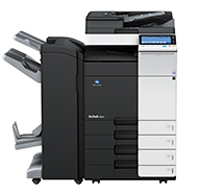 BIZHUB 454eWith more power at the hub of your business, the bizhub 454e multifunction copier is a powerful tool to speed your work and improve your productivity. 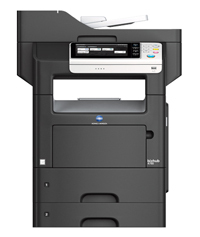 High-speed monochrome print/copy output helps keeps ahead of rising document needs -- and standard dual scanning captures both color and B&W documents at up to 160 originals per minute. BIZHUB 554eHigher productivity begins at your bizhub color touchscreen: flick, drag, double-tap, pinch-in/pinch-out and perform control functions more quickly and intuitively. With multifunction printer and copier solutions as close as your screen, you’ll be able to speed your workflow -- and standard dual scanning lets you capture both color and B&W documents at up to 160 originals per minute.